Tomatoes were first domesticated by Aztecs in the Andes who began selectively breeding the small-fruited wild tomato for heavier production of larger fruits. We don’t know exactly when this process began, but when Spanish explorers first brought tomatoes back to Europe in the early 1500s the plants had been long domesticated and substantially altered by the process. The English word ‘tomato’ comes from the Nahuatl (Aztec) word ‘xitomatl.’ But that wasn’t the first name by which the new fruit was known back in Europe. In French the tomato was called the pomme d’amour, ‘apple of love.’ There are several theories about that name. Some say that the tomato was confused with its botanical relative the mandrake, which is described as an aphrodisiac as far back as the Bible. Others say that it may have been a corruption of one of the tomato’s other early written names: the Italian pomo d’oro, ‘golden apple,’ which may suggest that the first imported tomatoes were yellow, or the Spanish pome dei Moro, Moorish apple (which may also be the source of the Italian name.) In Mediterranean areas the tomato was soon accepted as a food source. But in northern Europe there was much more skepticism. 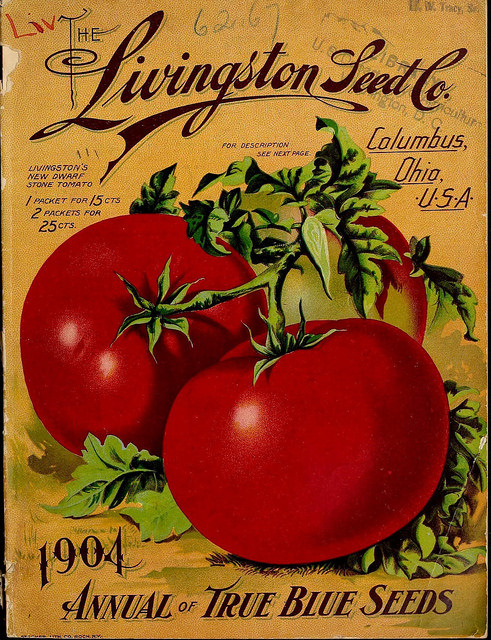 In England and Germany tomatoes were initially regarded as ornamental but dangerously poisonous. Some people said that their bright red color clearly signaled poisons lurking within. Some were understandably wary since the tomato was closely related to deadly nightshade as well as mandrake (which may or may not have actually had aphrodisiac effects, but was certainly poisonous taken in any significant quantity), and since tomato leaves and stems really were poisonous. Apparently some aristocrats’ experiments with eating tomato fruit did end badly, earning tomatoes the nickname ‘poison apple,” although K. Annabelle Smith at the Smithsonian notes in her article “Why the Tomato Was Feared in Europe for More Than 200 Years” that the fruit wasn’t to blame in itself; pewter dishes were fashionable, the lead in pewter was highly toxic, the strong acids in tomatoes leached lead from the plates, and it was easier to blame the exotic new fruit than to consider the possible dangers of familiar dishes. New life was given to the poison scare in the northern United States by the appearance of tomato hornworms, large green caterpillars with prominent horns on their rear ends. An agricultural journal noted in the 1860s that thirty or forty years earlier the hornworms had been considered poisonous in themselves, and that it had been thought that any fruit they might crawl over would become deadly as well, though the editor saw all such stories as antiquated follies. The tomato may also have suffered from scholarly attempts to identify plants discovered in the New World with plants mentioned by ancient authors. Linnaeus, casting around for a Latin name for the tomato, identified it with one of the mystery plants described by the ancient Roman physician Galen. Galen’s lycopersion (the first part of the name is clearly “wolf,” the second rather mysterious, but mis-transliterated in Linnaeus’ time as persicum, ‘peach’) had strong-scented yellow juice and ribbed stalks. Romie Stott’s Atlas Obscura article “When Tomatoes Were Blamed For Witches and Werewolves” suggests that Galen identified tomatoes with wolf peaches because of superstitions concerning witchcraft. For centuries before Linnaeus’ day belief in, and fear of, witchcraft had been widespread. Witch hunters had looked, among other things, for a mysterious ointment said to give witches the power of flight—and also the power of transforming themselves, or other people, into werewolves. Several of the toxic and hallucinogenic nightshades were listed as likely ingredients in this ointment, and the tomato, as usual, shared in the disgrace of its relatives. Some people, especially in England, seem to have objected to tomatoes merely because they came from foreign parts and were unfamiliar. English surgeon and naturalist John Gerard called them ‘rank and stinking,” perhaps objecting to the pungent odor of the foliage. King James I’s personal physician noted that they might be useful for cooling hot stomachs in the New World, or even Italy and Spain, but England was already cold enough.